There have been tons of clothing racks made out of plumbing parts, here's my little version of it. 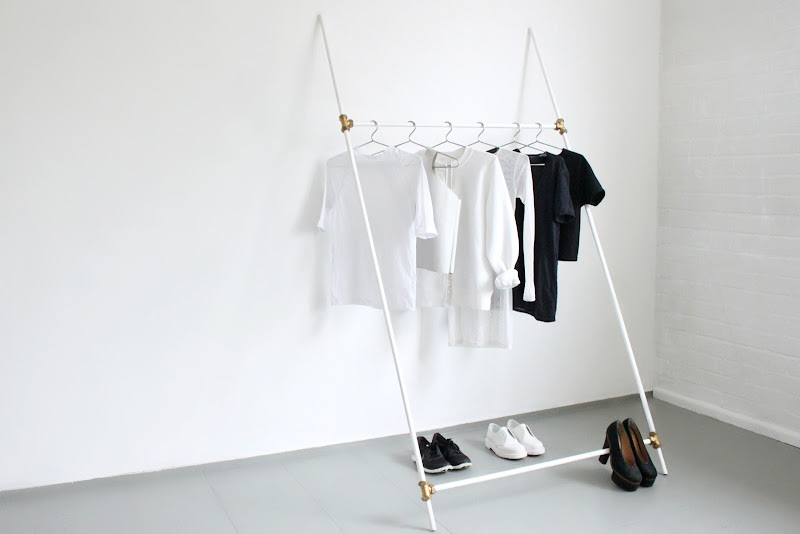 It is the easiest, most uncomplicated clothing rack imaginable, it is basically just a frame that leans against the wall. And surprisingly it turned out sturdier than I thought it would be, and is also really easy to deconstruct and move around. put the long tubes against the wall in an inclined way. Mine are on the floor about 75cm away from the wall. It seems like really far away. But the more you'll incline them, the sturdier your rack will be. Doesn't seem like it now, but once it is assembled it will be. 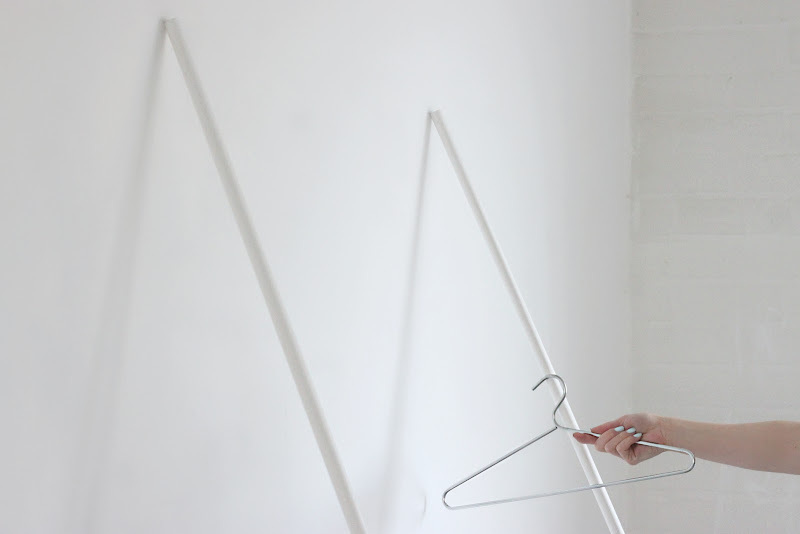 Put your hanger on a height where it will not be touching the wall , like shown on the fourth picture, and mark this spot on the tube. This is the height where you will place the horizontal tube. Put a bit of strong plastic tape around the spot you just marked before placing the 3 way joint. This bit of tape will make the tube thicker on the place where the hardware comes, it will secure it and prevent it from sliding down. Make sure the hardware is placed on exactly the same height on both long tubes. If not, the rack will turn out wobbly. After you've placed all four joints, you can assemble the rack by connecting the long tubes with the short horizontal ones in between. I planned to put two screws in the floor on which you can put the tubes on top to prevent them from moving. But skipped this step because the rack turned out to be much much sturdier that I had expected, because of the weight on the rack it really stays on it's place and leans against the wall. I'd love to see your entire apartment. Imagining a huge space, no walls, just beautiful white and black bits place in very specific places. Great design but need an empty room! ;) Love it! great idea! first i thought that it would move but actually it makes sense. gravity and stuff. thank you for the idea! wow, this is amazing! <3 thank you so much for the inspiration! 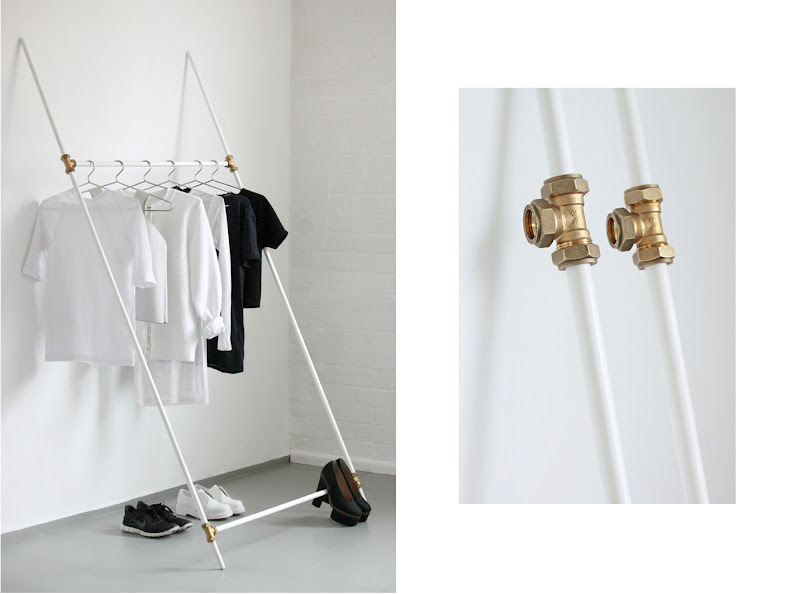 i've been looking for a nice diy clothing rack for weeks and this one is just perfect! Amazing! I'm so going to try this. Thank you, you're my inspiration. :O you are unbelievable. I bow to thee! This looks so great. Your ideas are wonderful! Great clean solution! How do you get the middle tubes to stay in the joints? You have the best DIY projects!! Brilliant and simple idea (no wonder on this blog). The only thing I'd be quite scared of would be the plumbing tubes scratching the wall paing under heavier load of clothes....or anyway. Wauw, super gave DIY weer Ivania! Dr is er maar eentje die dat zo goed kan! woooooooooooooow would like to have a wardrobe like that one day!!!!!!!!!!! Gorgeous as ever, you really do simplicity the best! Ok...so is there any end to your talent? Seriously epic DIY! I love it... this is just what I was looking for! So gaaf! Ik wil het deze week ook doen!! This would be a great solution for my disheveled entry way. I especially love the bar for holding the heels! Amazing idea!! You come up with the greatest modern DIY projects. love it! Love to visit your blog everyday :) Maybe we could follow each other on Bloglovin and/or GFC? I am so fond of you and your ideas. Gah, this is genius! Thank you for the easy to follow tutorial. it is really a great project! congrats! i admire your blog for the character you gave it. you are genius!! i love all your ideas. How cool! I wish I had the space to do it! so perfect and simple...you are genius. You have the best (simple) ideas ever, I love it. I want your mind please?! ha! What a great idea and looks so easy to make. When I have more room, I will certainly try this! That's awesome!! I wish I had a free wall! You so smart girl.. you think of the most brilliant things! Everything you own is so white! I like the clean look of the tubes. thats so awesome! You come up with some amazing things and theres something so beautiful about you and your minimalism love! Youve made me totally want to explore that kind of style! I think i would have to do it with colour though im not that adventurous! Never knew the equipment that I use everyday can be so useful apart from fixing the pipes. That is really an impressive art you did. I CAN'T BELIEVE HOW AMAZING THAT IS !!! Did I just yell ?! Seriously, it looks flawless !! I so want to do that when I'll be able to, thanks for the genius post ! I love your DIY projects always amazing and so simple. Hope it`s OK that I borrow your images for a post on my blog? Just wanted to write you a quick note to let you know how much I have been enjoying your blog! I really love your keen sense of aesthetic and style. Reminds me of the leaned ladders I've seen everywhere. love this diy.shared it on my blog. If you use shelves on your wall, select simple shelves with clean lines and avoid ornate brackets. Color does not matter, but stick with the same finish and style for all of the shelves in a room. I havent any word to appreciate this post.....Really i am impressed. you have got a great weblog appropriate here! would you like to make some invite posts on my weblog? We love your white DIY!!! Simple but sooo nice and usefull stuffs! This is a creative DIY project! I have a similar garment rack. They're so functional and are great for staying organized. This a great way to utilize the plumbing tools and plumbing things. Thanks for sharing. i seen your all plumbing component and i think its design by you and it's really use full and designable. Oustanding DIY, the materials were easy to obtain and the method is easy to follow also. You're the man! I'm really satisfied with this. Your ideas we're awesome. I'm looking forward for next post! Thanks for the information. It is very useful. Wow!!! 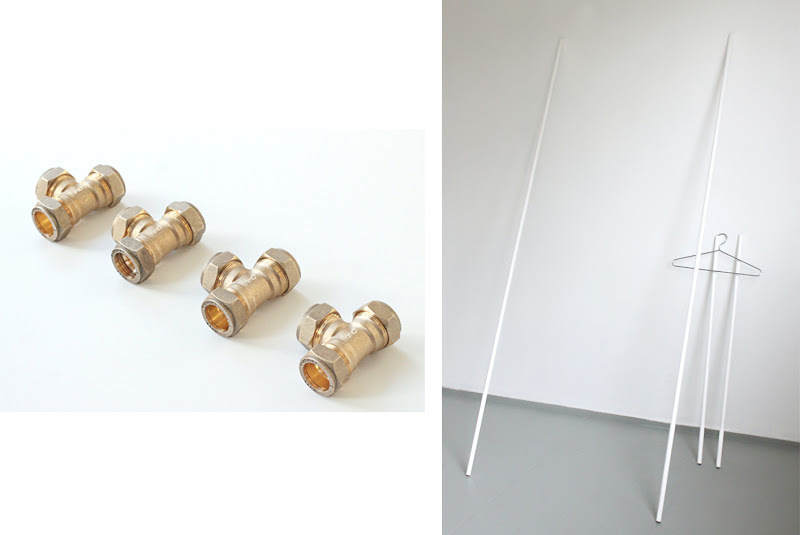 That's an amazing way to construct something beautiful out of something as simple as plumbing pipes! Our clothing gives us the warmth we need in our everyday lives. Thanks for sharing such useful information. Please keep sharing more! Each person should have basic items hanging on their Plastic hangers, they never go out of style and are always valid. For example, for women in their hangers to have a nice shirt of white color and a pair of jeans or black trousers is always advisable because they take out us of trouble in any occasion. These items, combined with various types of accessories always look good. Thank you so much for this wonderful article! Here we all can learn a lot of useful things and this is not only my opinion! Even BLNCK corp. and http://www.tradeadvisorbarnsley.uk confirmed it! شركات تسليك المجارى بغرفة التفتيش والتي غالبا ما تحدث فيها الكتمة عن طريق سقوط مخلفات صلبة فيها او بقايا اعمال التشطيبات المترسبة فيها وهو ما يتم عن طريق سوستة الضغط او عن طريق غطاس ضغط المياه. Love how you made a unique and cute rack from pipes. يقوم عمال شركة مكافحة الحمام بالدمام بتركيب اشواك مانعة لتعشيش الحمام بنوافذ منزلك ومنها عدة أنواع مثل الأشواك المضادة للحرارة وأنواع أخرى مصنعة من الاستانلس ، كما نستخدم آلات طاردة للحمام تعمل بالذبذبات عن طريق وضع بطاريات مشحونة داخل الجهاز ويعمل على منع الحمام من الاقتراب من النوافذ الخاصة بمنزلك . Goed bedrijf, vriendelijke mensen uitstekende service. Big Quan is not equal to big position, big position is not equal to high salary,(máy khuếch tán tinh dầu) high salary does not equal longevity, long life is not equal to fun, not afraid of low treatment, only afraid of short-term, not afraid to earn less money, only afraid to leave too early! إذا كنت تبحث عن دهان لإظهار دهانات المنزل في أفضل و أبهى حال يمكنك الإعتماد على دهان بالمدينة المنورة حيث يوفر لك معلم دهانات أكثر خبرة واسعة حيث يعمل على الإبداع في عمل الديكورات الرائعة بالدهانات و بسبب ارتفاع أسعار الدهانات علينا ألا نثق في أي دهان يكون غير قادر على إظهار منازلنا بالشكل الرائع الجميل الذي نرغب به بل يجب اختيار دهان محترف كي يعطينا ما نتمناه من الجمال و العراقة في التصميمات الداخلية و الخارجية للمنازل و المكاتب و غيرها من خلال استخدام الدهانات الجيدة إذاً عليك الإعتماد على [URL=https://tasmimm.com/دهان-بالمدينة-المنورة/]فني دهان بالمدينة المنورة[/URL] حيث يوفر عليك الكثير من الأموال فلا تتردد بالاتصال بنا.